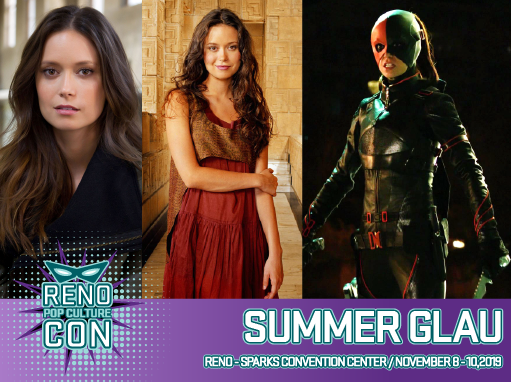 Summer Glau is an American actress born and raised in Texas. Summer began her career as a ballerina and found her way to acting after being discover by Joss Whedon. She made her acting debut portraying a Russian Ballerina in Whedon’s tv series ANGEL and was subsequently cast in his series FIREFLY where she was recipient of a Saturn award for her portrayal of young genius RIVER TAM. Summer received a second Saturn Award for her work as terminator CAMERON PHILIPS in FOX tv series TERMINATOR: THE SARAH CONNOR CHRONICLES. Over the next few years Summer recurred on many tv series including THE 4400, ALPHAS, DOLLHOUSE, and starred in NBC series THE CAPE. Some of her voice work includes KARA in SUPERMAN APOCALYPSE and WENDY in PETER PANZERFAUST. Fans favorite appearances include playing HERSELF in THE BIG BANG THEORY and ISABEL ROCHEV/RAVAGER in CW series ARROW.